1. I have a loaf of multigrain organic bread in the fridge so I decided to make my own bread crumbs. 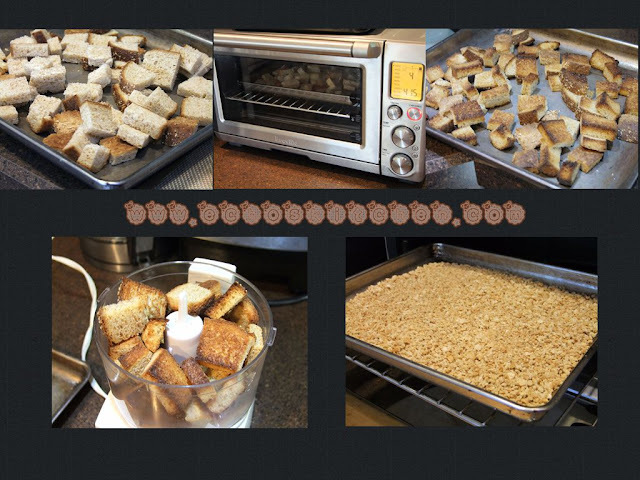 I cut the bread into cubes and toast it for 4-5 minutes until crispy, let cool. 2. Chop the bread in a chopper with 1 tbsp of italian seasoning herb and 1 tbsp of flaxseed powder, or whichever way you like your bread crumbs to be. 3. Toast the crumbs for another 2 minutes or until crispy, be careful not to burnt it. (Yes I did and had to throw the whole batch away and make a new one). Let cool. 4. Combined minced meat with all ingredients listed under ingredients. Let it marinate for 15 minutes. 5. Place the bread crumbs, egg wash mixture and all purpose flour side by side for easier work flow. 6. Spray or brush a thin layer of oil over baking sheet and work space. 7. Scoop out about 1/2 cup of minced meat and lightly flatten using palm, when the thickness is around 1 cm, use a cookie cutter (or steal your kid's play dough cutter like I did.) to cut out the shape of minced meat. 8. 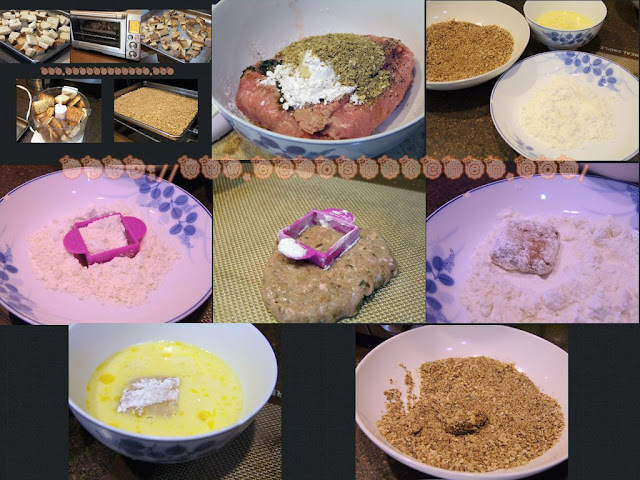 Coat the minced meat with a thin layer of all purpose flour, dip into egg wash and quickly dredge in crumb mixture. Place on baking sheet. Repeat until all meat is shaped and coated. 9. Preheat oven to 380 F/ 190 C, bake for 10 minutes or until crispy at the outside, you can turn once in between for even browning. 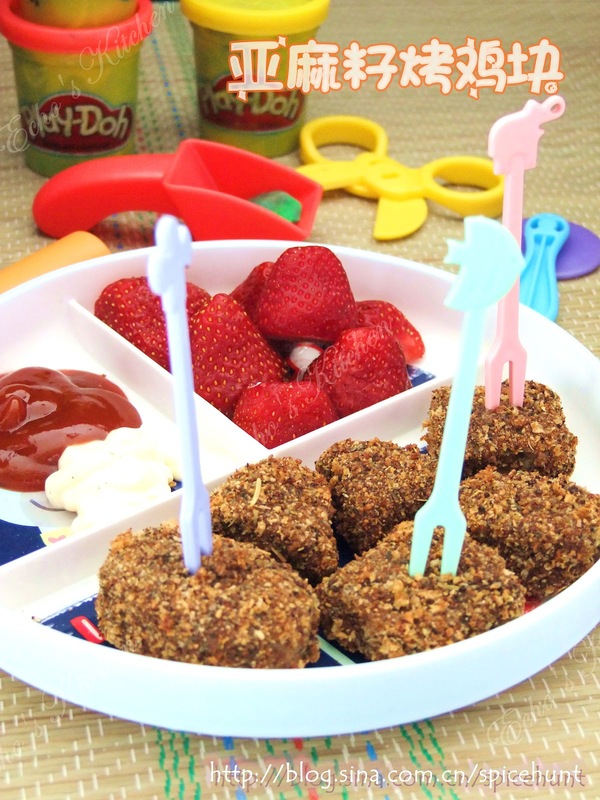 Serve with ketchup or any of your toddler's favourite sauces. 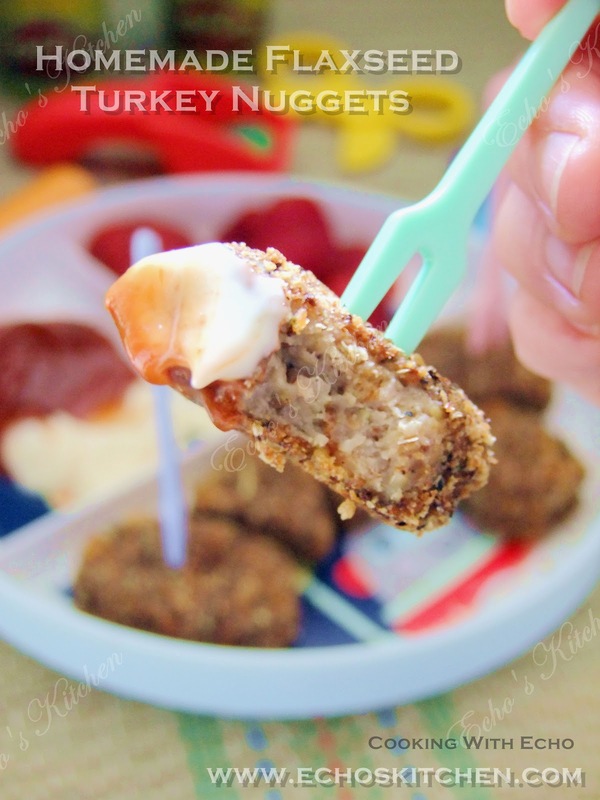 These nuggets freezes well in the freezer for at least a month, do feel free to make in bulk for future use!